After my last post I acquired a couple more dress forms and decided to do two things. First was to use Suzy Furrer’s method of drafting a moulage for different shapes. Second was to try using those moulages on non-professional forms and post a review. Although a professional form is a very nice addition to your sewing tools, it can be pricey and you may have an older form and not have the space or funds for another. The good thing is that this is a one-time purchase. You need to select a dress form based on your bone structure, NOT your bust measurement. I have found the most accurate way to do this is to compare your cross-front width to the form. PGM publishes this on their website: pgmdressform.com. If buying a form from EBay or Craig’s list, ask the seller to give you this dimension. Also check the shoulder length and cross back width. Your form should fit you at the shoulders and neck. Anything else can be padded. If you start with form that’s too big in the shoulders, you’ll never be able to get an accurate fit. Compare your shoulder, cross front and cross back measurements with any form you are considering. Get as close as you can with these three dimensions and fix the rest with padding. The padding can always be redone if you lose or gain significant amounts of weight, but your bone structure won’t change. The most common mistake seems to be getting too large a form. There are many companies who make professional dress forms and I’ll list some of them here. Wolf has always been the gold standard of dress forms. They are made by hand and last more than a lifetime. They are also the most expensive. Pricing depends on the options you select and Wolf forms can be over $1000. Occasionally one shows up on EBay or Craig’s list but they usually aren’t any bargain. PGM sells online at pgmdressform.com. They offer three options: collapsible shoulder and shaped hip for $399, collapsible shoulder with flat hip for $299, non-collapsible shoulder and flat hip for $199. You can always create your own hip shaping with pads but the shaping is nice to have a place to start. Collapsible shoulders make it easier to get garments on and off the form. The main drawback I found is that the wire cage at the bottom isn’t as nicely finished as the Wolf form, and can snag delicate fabrics. You can cover the cage with muslin if this is a problem. Roxy also sells online at roxydisplay.com. I have no experience with this company. One review I read rates them below PGM but better than the adjustable with dials. Foxy has forms with collapsible shoulders for $249. Fabulous fit sells a molded foam version for $387 and a professional model which looks like the ones at PGM and Roxy. The professional model sells for $887. They also offer a kit of fitting pads for the bust, shoulders, hips, thigh, etc. You can purchase this separately. I found the molded foam version at a garage sale for $25. I wouldn’t suggest these. There are better forms for less money. 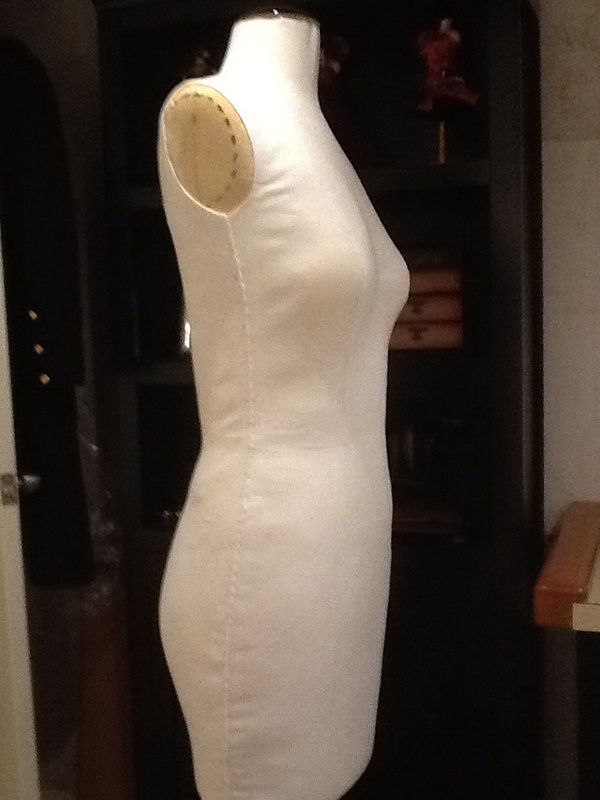 Least desirable in my opinion are the forms which feature dials that allow you to adjust the bust, waist and hip. The base is lightweight and they tip easily; very frustrating when you are trying to pin or adjust a garment. The dials leave spaces which can be annoying to work around. I did cover one just to try and make it somewhat usable. Now for the moulage review. I made three moulages for totally different figures and each one fit almost perfectly on the first try. I found learning to take accurate body measurements the hardest part. My three drafts looked entirely different but each fit amazingly well. Once you have your chosen form, draft and sew the moulage. I left the center front seam open when fitting myself and the center back open for fitting others. When you are happy with the fit, sew a final version in whatever fabric you choose for the cover. I would advise a medium weight cotton or linen. A natural fiber fabric will mold to the form easier than a synthetic. You want to be able to pull the cover tightly over the form so a knit is not suitable. Here is my Fabulous Fit form ready to begin. I used cardboard to add 5 inches to the length. 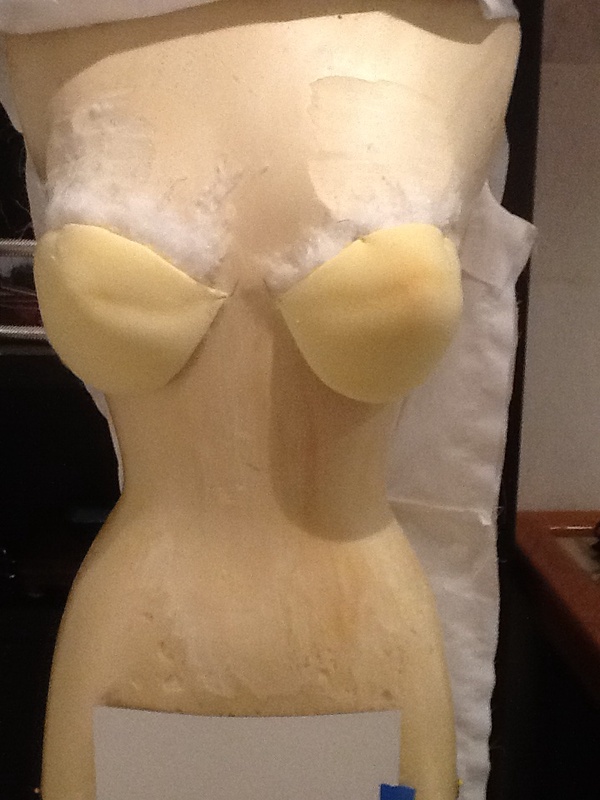 She also needed minor surgery at the back armhole and a slight breast reduction. This was accomplished with a kitchen bread knife. Bra cups were stuffed and positioned on the form with pins. 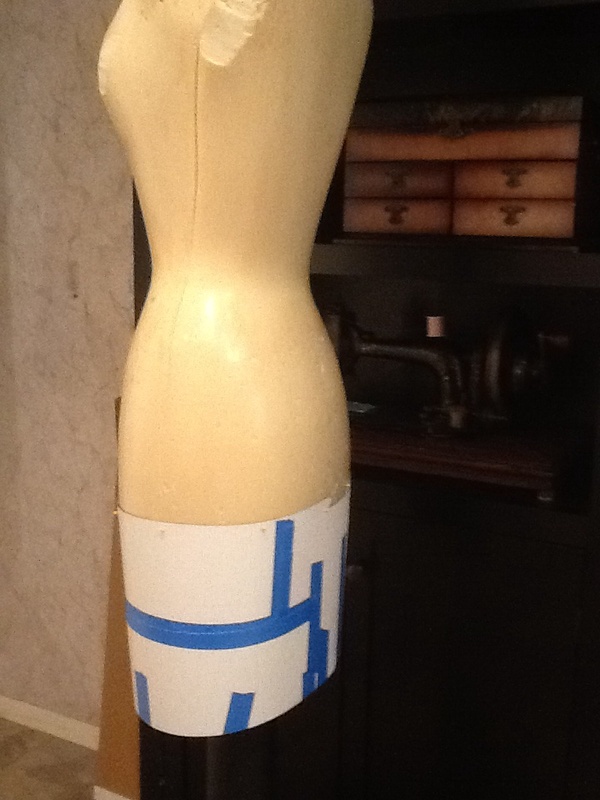 Since the neck was rough I draped a pattern to cover the neck and sewed it to the moulage before starting to pad. 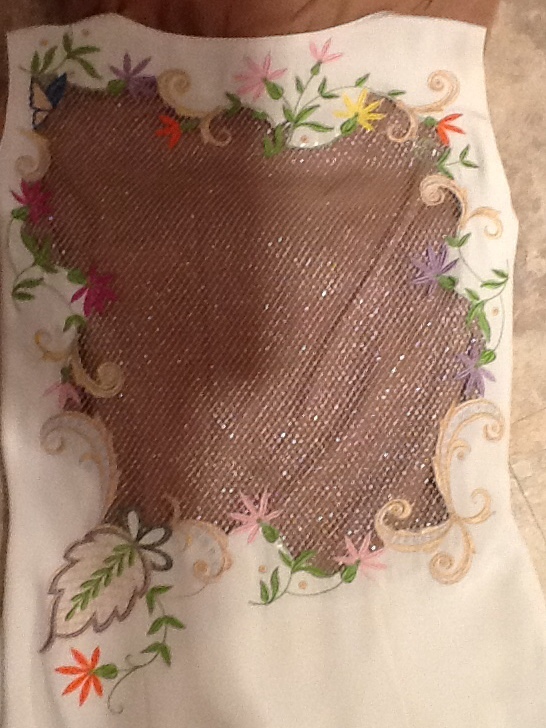 Notice the side seams are 3/4 inch wide and have been stay stitched. This makes it easier to turn and sew the sides evenly. 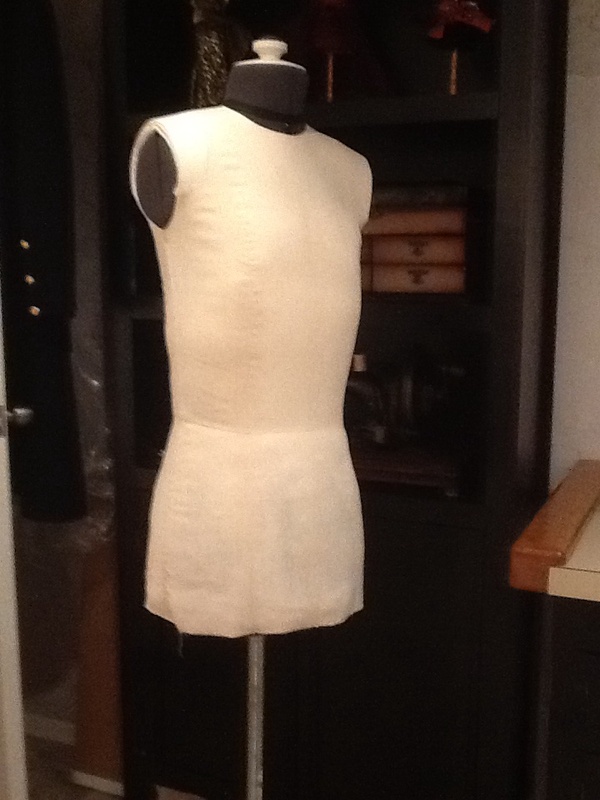 The moulage is sewn together at the shoulders and armhole facings attached to neatly finish the armseyes. The side seams are left open. 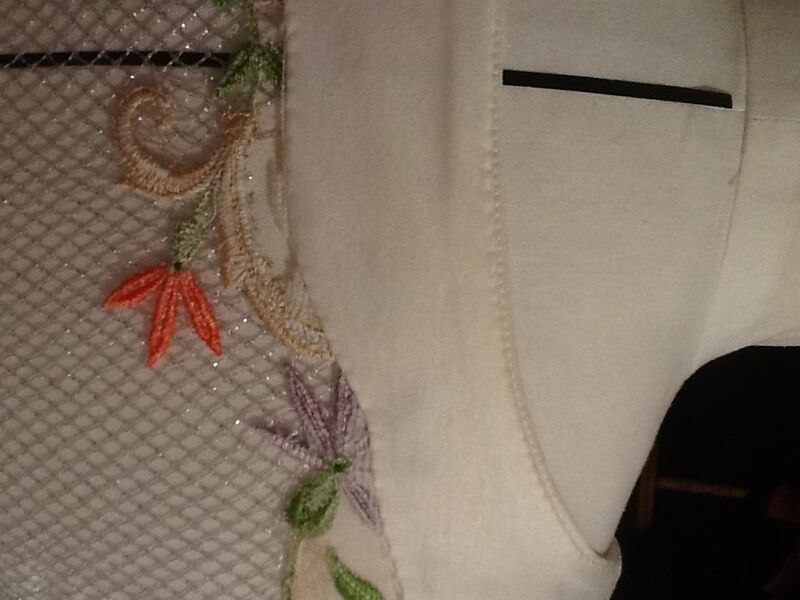 Also note the position of the armhole on the form and on the moulage. The form positions the arm angled backwards. The moulage reflects a more normal arm position. Start fitting the cover and padding at the top. Notice how the shoulders fit well but padding is needed to fill out the remainder of the cover. 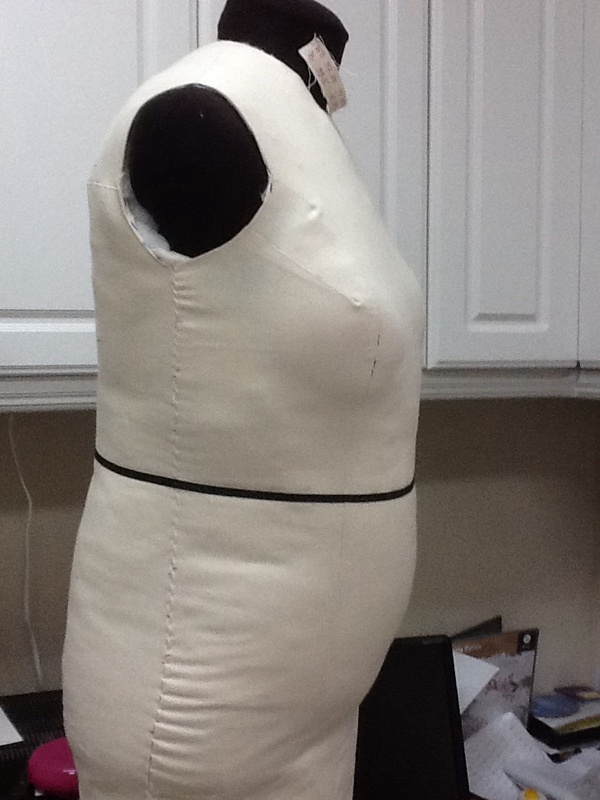 After the shoulders are fitted, position and pad the bust. You can use bra cups or a bra that fits well and you are willing to sacrifice it. Fabulous Fit also offers a kit of fitting pads but I did just as well using bra cups and shoulder pads. Continue to work your way down the form. I used a combination of shoulder pads, fusible fleece, heavy felt; just about anything you have on hand will work. 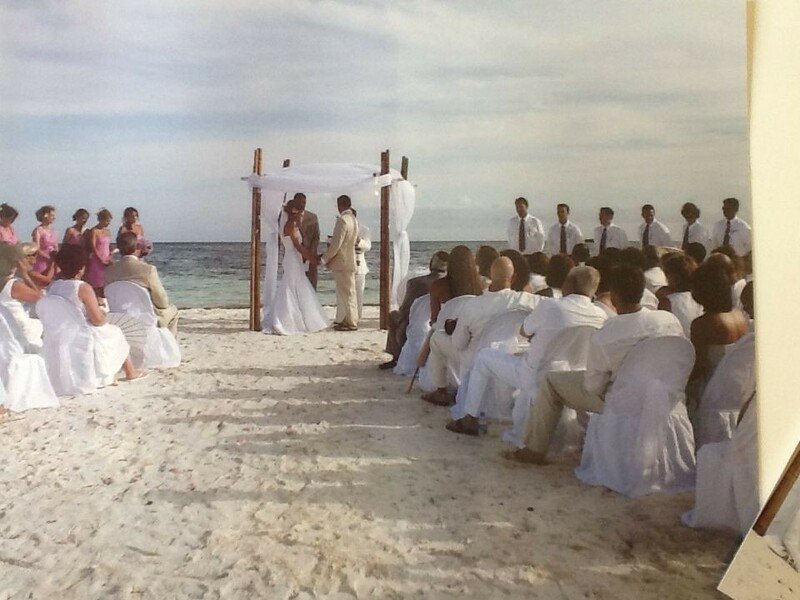 Do frequent checks to be sure you are getting the desired shape. 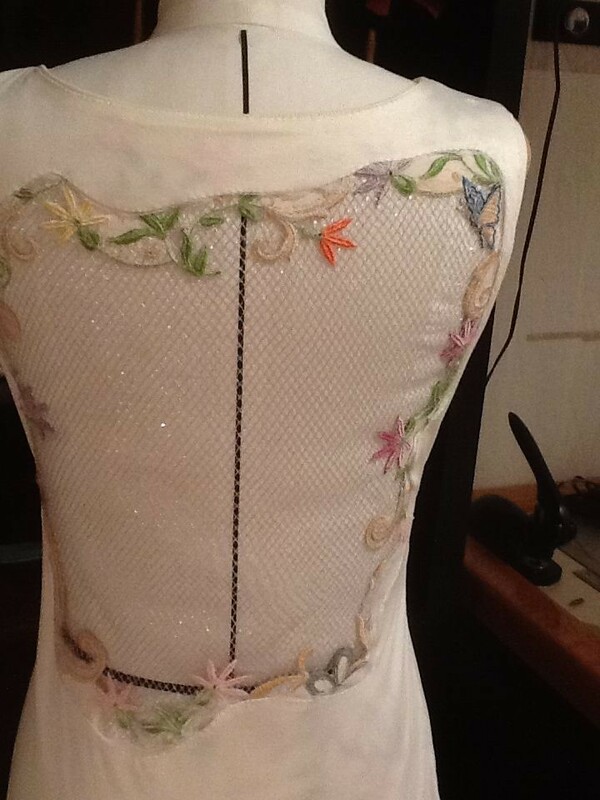 Pin in place and remove the pins as you add subsequent layers. I also used a steam iron to compress the padding as I worked. I used two large shoulder pads to establish the bumm shape and refined it with upholstery batting. I also added a layer of upholstery batting as the final layer. 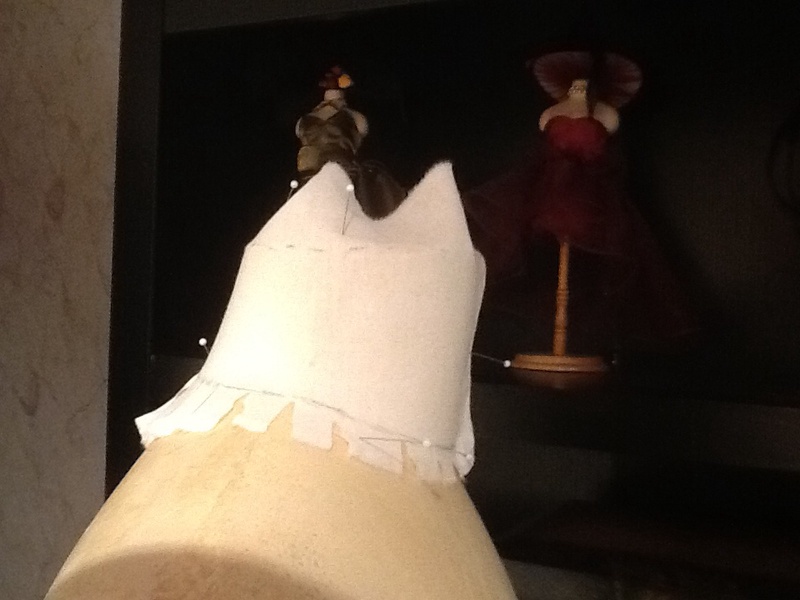 Upholstery batting feathers easily and covers the irregularities. Take your time. It can take a few redos to get the shaping right but you will do this once and have your double for years. Once she is stuffed pin the sides together and do a final check that you are happy with the fit. 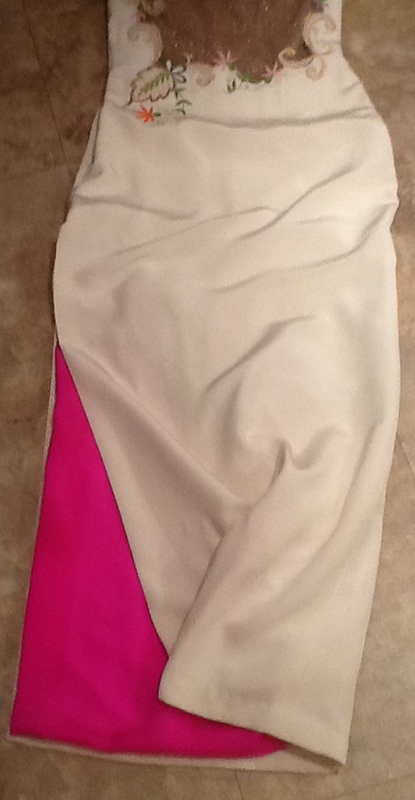 Leave one side pinned while you sew the other side seam; otherwise the cover will shift. 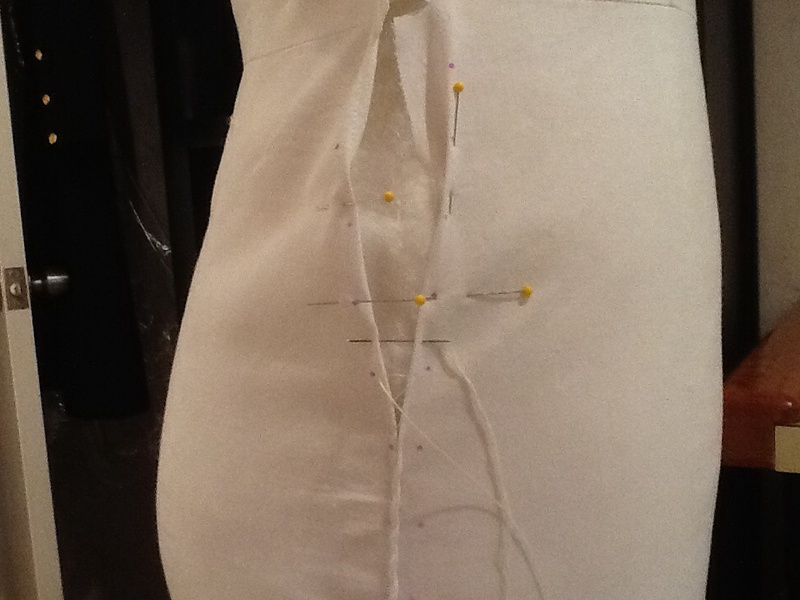 Fold the side seam allowances in and mark every inch to help keep the front and back aligned as you hand sew. I started at the waist seam and marked up and down from there. If you don’t put these guide points in and just start sewing you will wind up way off when you reach the end of the seam. Guess how I found that out? I find it easiest to start at the bottom and sew up. Use a 36 to 40 inch length of upholstery thread. You want enough to finish the seam but not so much the thread knots and is too long to work with. Why not just use a center back seam? First I found the padding shifted around too much when I tried to get a back seamed cover on and off. 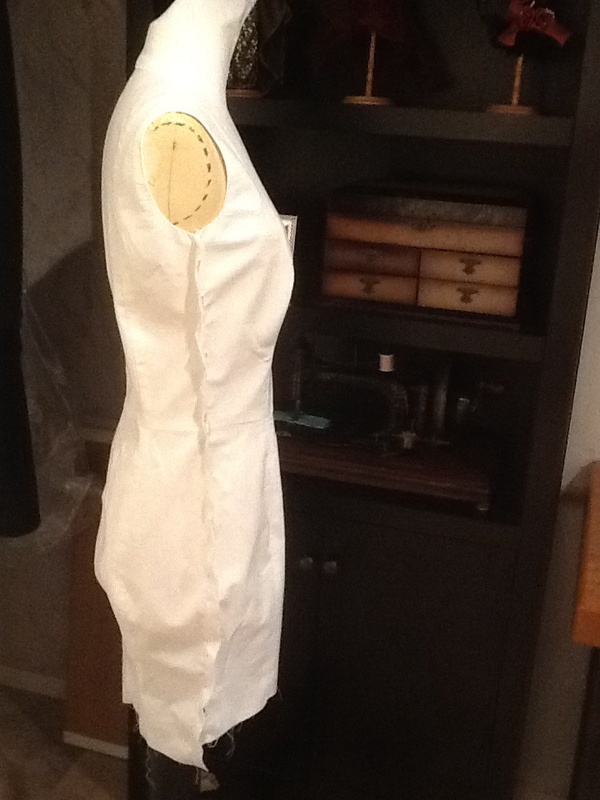 Also you need the side seams raised so they can be felt when you use this form for fitting and draping. Look at the professional forms. They are all finished like this. Insert the needle about 1/8 inch from the folded edges keeping the needle parallel to the floor. Pull the thread tight (you want this seam raised) and place the next stitch about 3/8 inch away. I sew with my right hand and hold the thread taut with my left. You may need a clip or two at the waistline. Finished! All she needs now is a heavy steaming to shrink the cover slightly. This custom cover was done on an adjustable form with dials. The figure was petite with a small bust. 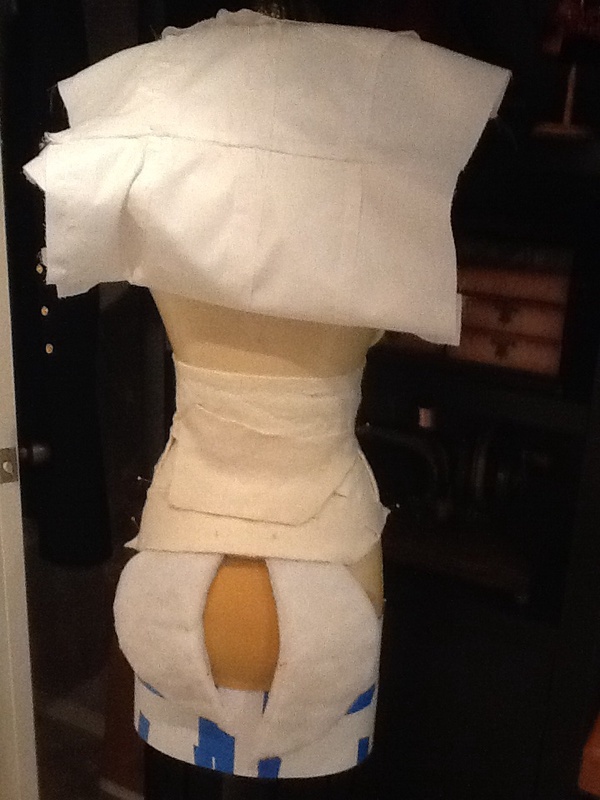 The moulage draft fit on the first try with one minor adjustment to shorten the front waist. Another draft for a fuller figure with large bust and abdomen. Once again the moulage instructions produced a perfectly fitting mold. If you want to make fitting much easier, invest some time to create your own double. I’ve done a few now and it still takes time but what a difference when I’m fitting garments!